It is early on Saturday 4th November – Sarah and I are on our way to Regent Street, carrying rucksacks and pushing wheelbarrows laden with items for the TOC display. Apparently, we do not look suspicious. Police officers are more concerned with directing cars, vans and trucks assembling in the side streets. All are waiting for 8.00am and permission to enter Regent Street. 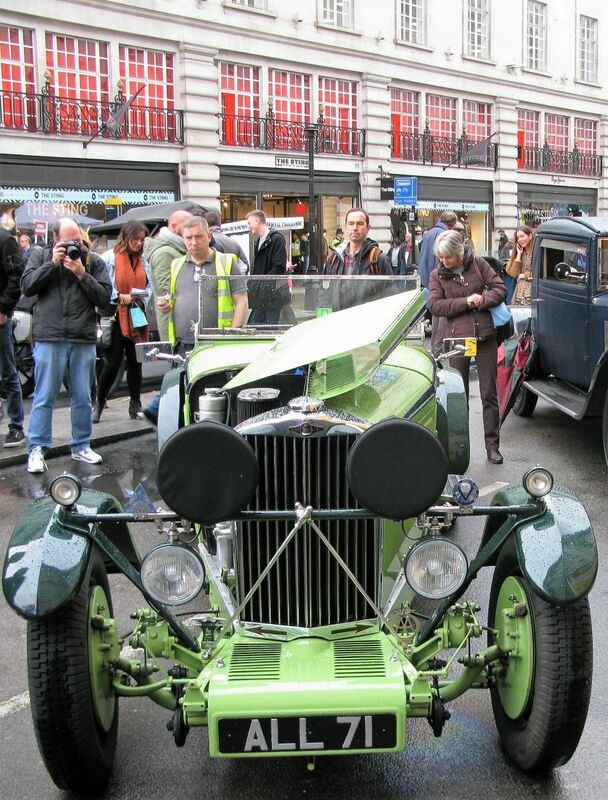 In the next two hours a ‘pop up’ display will transform Regent Street into a theatre of motoring for the day. In Regent Street, cleaners are busy sweeping pavements and emptying waste bins. Shop windows display fashion accessories with breath-taking prices while in doorways from cardboard boxes, cold stiff figures emerge. The contrasts of London never cease to both amaze and shock. Regent Street is finally closed to public traffic and the stage is set for an estimated five hundred thousand visitors to the Motor Show. First in position are the TOC exhibition trailer and the Percy Lambert Talbot, carefully unloaded by Alex and Bob. On schedule at 9.15am, the remaining Talbots arrive to complete the display. Trevor Andrews is resplendent as an Edwardian motorist with his 1909 Talbot 4AB. Simon Scott arrives on board his Talbot bicycle, now fully restored. Meanwhile Glyn Lloyd has transformed the exhibition trailer complete with video display and gazebos are quickly erected over the Percy Lambert car and engine display. The forecast rain has arrived but inquisitive visitors are already arriving in vast numbers. The next six hours pass in a blur. Sue Wheildon is busy selling much needed TOC umbrellas and a constant stream of TOC members drop in for tea and coffee, rapidly consuming Hilary Bryant’s chocolate brownies. Thousands of visitors continue to arrive, taking photographs and asking questions. 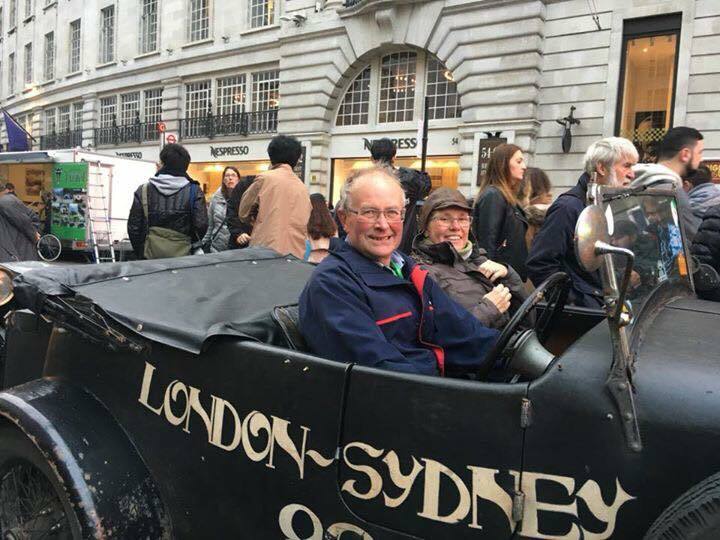 Nick Savage’s 8/18 and the Lloyd’s 10/23 are both favourites with photographers while visitors are amazed to learn of the exploits of the Wheildon’s London – Sydney car and the travels of Sally Morris’s 14/45. The fabric covering on the Philpott’s Weymann 14/45 coupé is a constant source questions, while Mike Freeth’s James Young DHC 105 and Tim O’Brien’s Carlton 90 are much admired. The 25HP Percy Lambert is a centre of attention throughout the day. Visitors are delighted to have the opportunity to sit in PL2, carefully supervised by Foppe d’Hane. However, I suspect many are not fully aware of the historical significance of this car. My niece’s partner has optimistically decided he would very much like James Tibbitts’ Brooklands 105. Meanwhile, throughout the day, Tom Whatton, immaculately dressed in overcoat, three-piece suit and bowler hat, epitomises the owner driver of the 1930’s. Between television and media interviews, Tom enthrals visitors with his 105 Ulster Saloon. The TOC now has its very own TV celebrity. As the day draws to a close, the crowds are thinning out, but the numbers around the TOC display increase. TOC members are waiting to either move off with their cars or help dismantle the display before moving on to Shampers Restaurant just off Regent Street. There James Tibbitts efficiently organises operations, reminding guests what food they have ordered. Perhaps it is just me, but I feel a slight sense of reflection in the room. Reflection on the Motor Show and of David Booth’s imminent departure to New Zealand. Martin Bryant presents David and Gill with a painting of David’s Talbot 90, commenting on David’s immense impact on the development of the TOC and acknowledging it will be a time of change for the Club. Unfortunately, it is now time to leave. Stepping out into Regent Street, the street lights are shining through the mist and reflecting on the damp road surface below creating strange shapes and shadows. For a brief moment, at the end of the road, I am convinced in the shadows I can see the outline of a tall imposing gentleman wearing a bowler hat about to get into his Talbot 105 saloon…. It’s been a long day - time to go home. Following the Motor Show, James Fack asked me the simple, but pertinent question, was it worthwhile? I was much too closely involved to give an objective answer. However, hopefully it has raised the profile in a positive way of both the Talbot marque and the Talbot Owners’ Club amongst car enthusiasts and members of the general public. Putting on the display also emphasised the depth of skills, expertise and contacts the Club has through its membership. Special thanks must be given to Glyn Lloyd, David Roxburgh, David Kenworthy, James Tibbitts and Viv Fishwick whose combined input brought the vague idea of a display in London to reality. 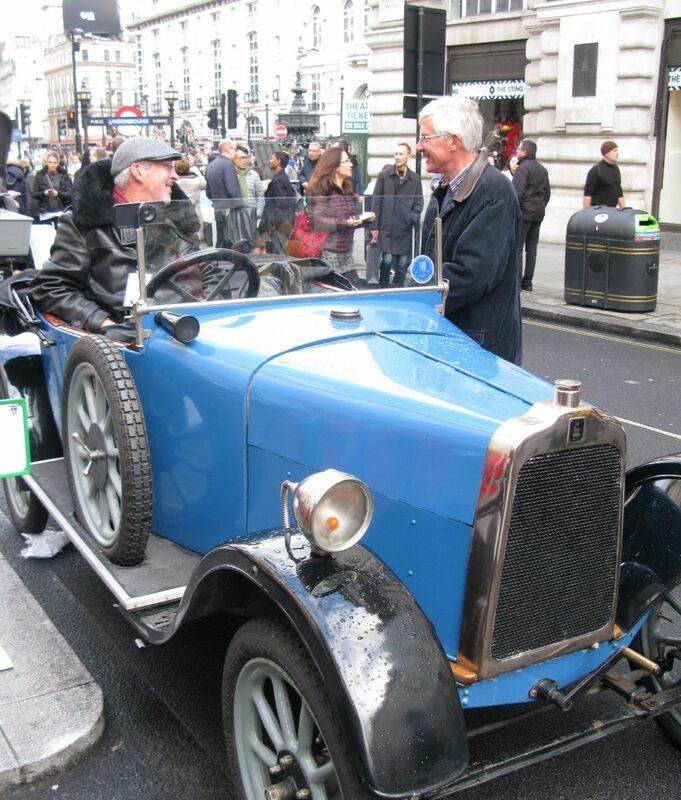 The Club also received incredible outside support in putting on the display, highlighting the latent interest and goodwill in the old car movement from the general public. Again, special thanks to TCM Trailers for the exhibition trailer, Colour Graphics who supplied the display material and posters and finally Shampers Restaurant. In all cases, the staff of these businesses went to exceptional lengths to assist the TOC in making the day happen. Was it all worthwhile? I will let others decide.